From the author: The Journey is actually a story about many journeys, and it began with the story of two girls I met in a refugee center in Italy. After meeting them I realized that behind their journey lay something very powerful. So I began collecting more stories of migration and interviewing many people from many different countries. A few months later, in September 2014, when I started studying a Master of Arts in Illustration at the Academy of Lucerne, I knew I wanted to create a book about these true stories. Almost every day on the news we hear the terms "migrants" and "refugees" but we rarely ever speak to or hear the personal journeys that they have had to take. This book is a collage of all those personal stories and the incredible strength of the people within them. Francesca Sanna is an Italian illustrator and graphic designer who moved to Switzerland to follow her dream to work as an illustrator. She graduated in 2015 from the Lucerne School of Art and Design with a Master of Design with focus on Illustration. The Journey is her first picture book. "Given the ongoing refugee crisis in Europe and immigration debates in the U.S. and abroad, Sanna’s story is well poised to spark necessary conversations about the costs of war." "Simultaneously heartbreaking, scary, and brightly hopeful, this timely tale with simply captivating artwork will spur little ones to ask questions that lack easy answers." "A necessary, artful, and searing story." "Gorgeously stylized, spare and powerful"
"The crisp blend of realistic and fantastical illustrations in Sanna’s debut picture book impart as much content and emotional depth as its carefully woven text narrated by an anonymous child. […] Based on a compilation of immigrant interviews, this selection is timely and beautiful, appropriate for use with young children given the continuing situation of refugees around the world made particularly visible in recent years." "Sanna’s stylized illustrations, with gargantuan villains and swirling inky black, are both captivating and unsettling." "[Francesca Sanna’s artwork] is both realistic and fantastical, done in a striking, graphic style. "The Journey" will be a wonderful teaching tool for those who are welcoming refugees into their community. For those who have escaped war, this book might prompt them to share their own stories." 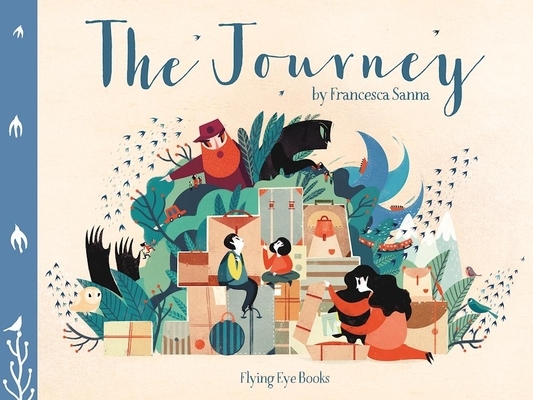 "The anguish of a family seeking refuge from war and trying to reach safer shores unfurls with heartbreaking directness in The Journey, a beautiful picture book by Francesca Sanna." "The Journey offers a beautiful message to readers — young and old alike — about the difficulties of finding a new home, and the value of welcoming strangers once they arrive." "A book that explores the heart wrenching need to abandon one's home amid war." "startling, poignant […] It’s a story that has lingered in my mind since I first read it, and I think it will be there a long while." "Through beautiful and powerful illustrations, The Journey vividly explores the universal story of all those who have had to leave behind the place and people they love." "[The Journey] is a brightly colored and beautifully illustrated tale on a dark and frightening topic. […] The contrasting pictures and words are likely to inspire conversation, asking children and adults alike to discuss the topic of conflict and the plight of refugees the world over. I’d highly recommend the use of this book in an educational setting. Francesca Sanna is an illustrator to keep an eye on." "Haunting illustrations chronicle one refugee family's harrowing escape from the darkness of war. A tale of love, courage, and perseverance." "This powerful look at flight follows one family from their homeland. Traveling by bike, by car, even hidden in a truck bed, they eventually reach their destination only to face a looming guard and an insurmountable wall. While the time and place are never definite, the sadness and uncertainty are real." "The potent, matter-of-fact narrative becomes even more powerful set against striking illustrations that are stylized, beautiful, and harrowing. [...] Over and over the emotional weight of the story is conveyed through affecting, sometimes heart-rending images juxtaposed with the voice of innocence." "5 STARS [...] Hauntingly beautiful […] emotionally charged […] This is the perfect book to read to kids, to teach them about what is going on in the world today." "What a beautiful and haunting book. This story of a family that loses its home and father to war and must set out for a safer home might not be a soothing bedtime tale, but for a child curious about the word "refugee," I can hardly think of a more delicate and powerful introduction." "[The Journey] is a powerful book that is sure to encourage conversations with young readers about the struggles children living in unsafe environments currently face." "This story was created to bring light to the recent refugee crisis in our world, and approaches the issue with incredible grace and metaphor. Debut Italian author/illustrator Francesca Sanna weaves a heartbreaking and hopeful tale with her beautiful words and illustrations." "An honest and engaging portrait of what a refugee family goes through to get to a safe place to live." "MUST-READ PICTURE BOOK OF THE YEAR [...] Not only is it an important work in children’s literature, but it’s an important story that needs to be read to people of all ages. […] It’s a story that serves as both a mirror and a window into an epic adventure of strength and fortitude unlike any picture book you may ever read." "A beautifully illustrated picture book that deftly explores the unimaginable decisions made as a family leave their home and everything they know to escape the turmoil and tragedy brought by war." "The story we read about in The Journey is universal and timely"
Sanna’s prose is lyrical yet sparse enough to emphasize the harsh and abrupt changes that the family experiences, and she has created a beautiful interplay of words and pictures. [...] All of the illustrations are beautifully layered and textured with color, pattern, and meaning. "Francesca Sanna creates images that evoke the cost of war to all who are threatened by it. […] Emotional, often stark, yet also hopeful, they will allow readers to share the emotions felt by the many refugee families looking for shelter and safety." "[The Journey] is a powerful look at the refugee experience"
"This beautifully universal refugee story is essential reading." "What a beautiful, heartbreaking, hopeful, necessary book." "Chilling, haunting, and hopeful, this book will resonate with readers long after they’ve closed the cover." "I am so grateful for this candid, colorful and graceful telling of a family's fleeing of home that transcends any specific time in history or place on earth to welcome us all into its pages and its story of common courage and hope." "Sanna met refugee children and combined their stories to create this brilliant book told from a child’s perspective – but with an awareness of an adult’s perspective too. […] The story has darkness, and fear, and worry, and shows the heartbreaking decisions families have to make when they’re trying to stay alive. There are also moments of strength and hope." "It’s not just children who require stories like these in order to better understand current events and the world around us. Politicians, and bigots, and other grownups with hardened hearts who’ve forgotten how to be human—these are the readers who need to read these books in order to remember that people are people, some things are universal, and also that books are amazing." "The Journey will make you appreciate your life and think about ways you can help others who are not as lucky."